The life of a second round pick is not usually a luxurious one. Many of them won’t last with the team that does select them, but rather jump from team to team desperate to find a home. How likely is a second round pick to work out? From 2010-2016, there were 35 second round draft picks who made significant impacts in their NBA careers. That’s 35 players out of 210, making the likelihood of a second-rounder making a significant impact in the league around 16.7%. I was also generous at times when including a player to have made a significant impact in the NBA. As you can see, there are some legitimate stars that have come out of the second round including Draymond Green and Nikola Jokic. The value of hitting a pick later on is very high. To compare, Nik Stauskas who was drafted No. 9 in 2014, is going to make $4,333,931 next year for the Nets. Nikola Jokic on the other hand, who was drafted #41 in that same draft, will make $1,600,520 as the Nuggets best player on the roster. The probability of hitting on your second round pick in the NBA is very slim. Here are five players who have a chance to beat those odds. It’s impossible to not respect Jevon Carter for the way he plays the game. He hounded opponents, pressing every single second he was in, playing 35 minutes a game. Carter was a three year starter at West Virginia, and in his senior season he averaged 17.3 PTS, 6.6 ASTs, 4.6 REBs and 3.0 STLs. He also managed to shoot 86% from the free throw line and 39.3% from three. Carter is small for a point guard at 6’1″ and also isn’t young at 22 years old. If he can end up on the right team, he potentially can become a good backup point guard early on in his career. He will bring a lot of energy off the bench and will do a good job slowing down the opposing point guard. Carter also has an above average offensive game with the ability to knock down an open 3 as well as create for himself. Vanderbilt only managed to play 14 games last season at Kentucky because of nagging foot injuries. In the games he did play, he averaged 5.9 PTS and 7.9 REBs in 17 minutes. His shooting will have to improve if he wants to make a strong offensive impact, because for now he has more of an Andre Roberson style of play. Vanderbilt has an excellent mix of strength, size and length and can potentially be a great defender in the NBA. Being able to guard his position is extremely important when you think about the guys that play there (LeBron, Durant, Kawhi). If injuries do not haunt this 19 year old, he has the potential to become a great player in the league. Chimezie Metu is a very intriguing prospect. He is a great athlete who has consistently been improving his skill. After attempting only 3 three point attempts in his first two seasons at USC, he went 12 of 40 last season. He shot 51% from the free throw line his freshman year and increased it to 73% or better for the next two seasons. Last year Metu averaged 15.7 PTS, 7.4 REBs and 1.7 BLKs a game. Although a good shot blocker, he is quite skinny and will get punished at times with his back to the basket. However, he can guard the perimeter well with his elite lateral quickness. His offensive game looks smooth and if he can extend his range, Metu could become a starter for the right team down the road. Malik Newman was a huge reason for Kansas making the Final Four last season including a 32 point performance in an overtime win over Duke in the Elite Eight. After transferring from Mississippi State and sitting out a year, Newman averaged 14.2 PTS and 5 REBs while shooting 84% from the line and 41.5% from three. Newman has the ability to score on and off the ball, and is not afraid to put it up. That fact is both a strength and a weakness for him. He tends to take terrible shots after hitting one or two in a row, which can kill a team’s flow offensively. Although he didn’t average many steals or blocks, he has the athletic ability to defend his position at the next level if he puts in the effort on that side of the ball. Newman has the looks of becoming a solid bench scorer for a lengthy NBA career. Yes, this name should sound familiar. Kostas is one of Giannis Antentekoumpo’s four brothers. After averaging only 5.2 PTS and 2.9 REBs on 15 minutes a game, there is a lot of development needed for this Antentekoumpo to be anywhere as good as his brother. Antentekoumpo is 6’10” with a 7’2″ wingspan and, despite just one year of college ball, is 21 years old. Offensively, he currently is not much more than an alley-oop or put-back dunker. 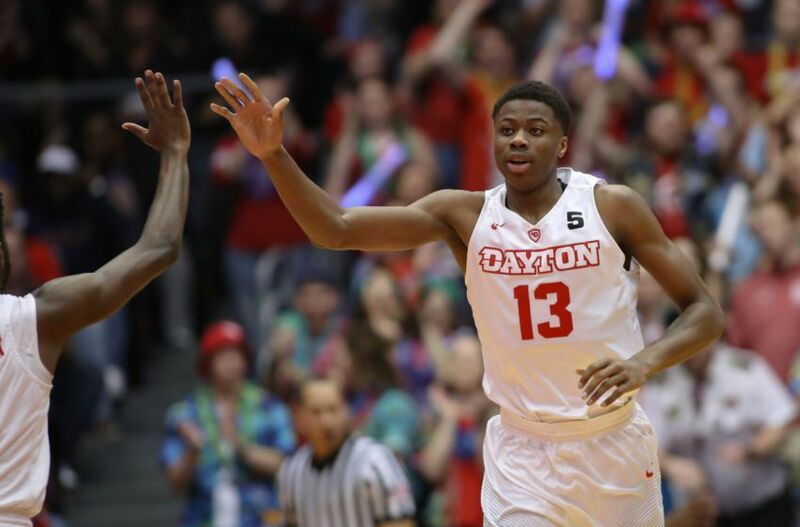 Defensively, he moves well for his size and even averaged 2.8 BLKs per 40 minutes in his one season at Dayton. To be able to play at the next level, he needs to fill out his frame and heavily work on his jumpshot. Kostas is even more of a project than his brother was, but if a team can figure out how to unlock his potential, then they would be getting a massive steal late in the second round.